Disclaimers appear on the bottom of printed sales invoices and are used to selectively provide your customers with a wide variety of information, ranging from seasonal and promotional messages to pertinent company policies. 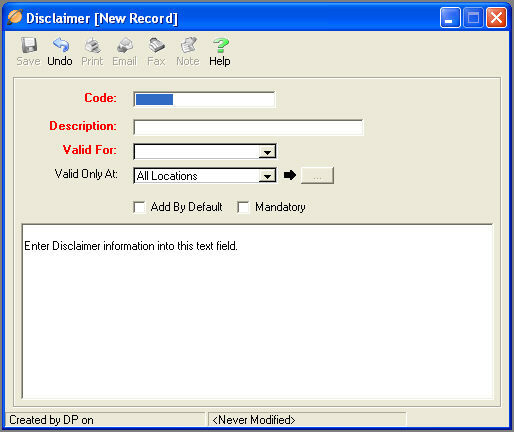 To access the Disclaimers Master Files from the menu bar of the main TeleTracker Online screen, click Master Files, then Disclaimers. To create a new Disclaimer, click on New button located on the toolbar. To open an existing Disclaimer, select the Disclaimer from the Disclaimer Master File list and click the Open button. Code : This field is the unique name used to identify each individual Disclaimer. Description : This field is used to further describe your Disclaimer code. Valid For : Select the appropriate Valid For option. The Disclaimer will only be valid for the product(s) linked to this option. Valid Only At : Select the appropriate locations for which this Disclaimer is valid. Add By Default : When placing a check in this box, the Disclaimer will automatically become part of each new sales invoice, but may be de-selected at the point-of-sale. Mandatory : When placing a check in this box, the Disclaimer will automatically become part of each new sales invoice and cannot be de-selected at the point-of-sale. Creating and utilizing Disclaimers will significantly enhance customer communication at the point-of-sale.